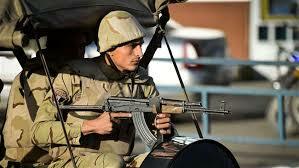 An attack on a security convoy in North Sinai Monday left at least 18 people killed, most of whom were policemen. The interior ministry noted that a group of militants attacked a security convoy between Qantara near the Egyptian port city of Ismailiya, and El-Arish, the capital of North Sinai. “As the forces dealt with the car, it blew up,” the interior ministry said. The explosion was followed by shooting by militants who emerged from the desert area along the sides of the road and began shooting at security forces, The New Arab reports. The attack claimed by the Islamic State group (IS) killed 18 policemen among whom two officers reports say quoting security and medical sources. Seven people, three policemen and four ambulance workers, were also injured in the attack, reports add. The members of the United Nations Security Council strongly condemned as “heinous and cowardly” this terrorist attack . “They expressed their deepest sympathy and condolences to the families of the victims and to the Government of Egypt, and they wished a speedy and full recovery to those who were injured,” read a statement issued to the press by the 15-member body. Council members reaffirmed that terrorism in all its forms and manifestations constitutes one of the most serious threats to international peace and security, and underlined the need to bring perpetrators, organizers, financiers and sponsors of these “reprehensible acts of terrorism” to justice. The Sinai has become a safe haven for the terrorist group and criminal organizations, which have been staging attacks against security personnel and armed forces. The terrorist groups who claim they are avenging the removal of the Islamist President Mohamed Morsi by current President al-Sisi in 2013 have also stepped up attacks against Egyptian Coptic Christians in the restive peninsula and in other urban areas of the North African country. Written by: KanelkaTagba on September 12, 2017. Posted by KanelkaTagba on Sep 12 2017. Filed under Headlines, World News. You can follow any responses to this entry through the RSS 2.0. Both comments and pings are currently closed.